Initially when I was thinking of doing the Stashbusters series I was mostly thinking that it would be a way to make myself use the stamps in my stash (mostly new-to-me ones) so that they’re not languishing unused for ages. But as I was planning today’s video I realised that stamps aren’t necessarily the things that I neglect most. Embellishments are more likely to be neglected, along with patterned papers. It’s not uncommon for me to make cards that are just stamping and colouring, perhaps a little die cutting. So I thought for my Stashbuster video today I would try to use some of the embellishments that I have in my stash, and I decided to go to the the Love From Lizi December 2018 card kit for this. I started with a kraft card base and masked off a strip to the left hand side of it. I then lightened the strip by inking it up with Brilliance Moonlight White pigment ink. Once I was happy with the coverage of the white ink I placed the Flutterby stencil over the top of the strip and ink blended over the top with Mermaid Lagoon Distress Oxide. As the card base was longer than the stencil I did have to do the butterfly stenciling in two parts, moving the stencil down in between. Next I used the butterfly bodies from the coordinating Flutterby stamp set and stamped them with Squeezed Lemonade Distress Oxide. I felt the butterflies looked a little plain so I decided to add the stamped versions of the wings over the top of the ink blending. I used the Mermaid Lagoon Distress Oxide again, and was careful to just ink up the wings of the butterflies so that the bodies and antennae would still be yellow. Once I’d completed all the stamping and was happy with my butterfly panel I removed the masking tape from the card base. One of the stash elements I wanted to try and use to embellish this card was some blue yarn that came in the Love From Lizi October card kit (which you can see more of here and here). I tied a piece of the yarn around the card base to create a border between the inked portion and the plain portion of the card. I also wanted to use one of the doilies from the December kit. They’re really not to my normal style and are not something I would usually use. I decided that one of the puffy stickers from the sticker sheet in the kit would work well as a sentiment in the centre of the doily. I die cut a piece of one of the patterned papers to create another layer between the sticker and the doily, and darkened the edge of the circle with some dark blue ink. I then attached the sticker to the die cut circle, glued that to the doily, and glued the doily to my card base. As I don’t have glue dots I rolled up a piece of double sided tape and used that to adhere my yarn bow into place. My aim with this card was to use what, to me at least, are more vintage style elements whilst keeping true to my more clean and simple style. I think I was fairly successful in my goal, and it was fun to challenge myself in this way. I did struggle with the yarn bow a bit, and I’m still not convinced that I like doilies on cards. Or at least, on the cards I make. But it was good to push myself in this way. I still have several of the doilies left, and also some buttons and flowers that came in the kit that again are not to my usual style. Maybe I’ll challenge myself to use them for a future project! I just wanted to stop by to say hello and to thank you for visiting my blog and leaving comments on my cards for the CIC challenge. Just wanted to mention that I do have the CIC logo on all (3) of my entries. Thanks for your comments. I enjoyed stopping by your blog – you have some really amazing cards. I’d like to invite you to stop by my challenge blog and play along whenever you can. They’re always Anything Goes/Family Friendly and we have some really great prizes. I’d love to have you join us when you can. Have a great week! Thank you for stopping by and commenting. I appreciate it. Glad you have it included – I only mentioned that when I didn’t see it, but it’s possible it hadn’t loaded. I’m so pleased that you enjoy my cards. I shall have a look at your challenge when I have a chance 😊 Thanks again. What a beautiful butterfly stenciled edge you created on this pretty card! Thank you for joining us in the CAS Stencil challenge! How lovely! I like all the layers and your use of the doily. The colors look fantastic against the kraft. Thanks for sharing with us at Inkspirational! Yes!!! My most neglected supplies are my embellishments. Like you, I usually stamp and die cut and almost never use pre-made embellishments. I’m going to take this stashbusters challenge with my embellies and see what happens too. This is a brilliant use of all the elements on my current challenge . Have just watched your video which was very easy to follow. I have been thinking of getting some of lizzies kits so it is nice to see how some of the bits can be used. Thankyou for coming and spinning the butterfly wheel with me. Hugs Mrs A. Very pretty card. Thanks for joining in at City Crafter. What a pretty, vintage look on this lovely card! Love how your used your embellishments. 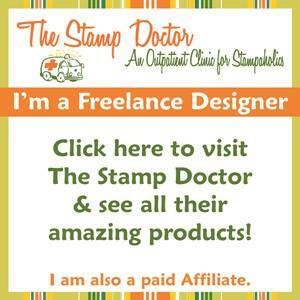 Thanks for sharing with us at Addicted to Stamps and More and I hope you will join us again soon. Beautiful card! Thanks for joining in the fun with us at a2z. So pretty! Thanks so much for sharing with us at ATSM this week!! Beautiful card! The doily and the butterflies work wonderfully together! Thanks so much for joining us at Fusion.